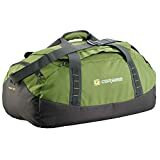 Premium Caribee multi-purpose gear bag for travel or sports. Innovative folding design allows this gear bag to fold into itself for compact storage that’s ideal for travel. Modern contemporary styling and extremely light weight. Made from strong rip stop nylon materials; Large lockable main compartment. Two handy end zippered storage pockets; Internal utility pocket. Adjustable & removable shoulder strap; Dimensions: 60 x 35 x 36cm; Capacity: 48 litres approx; Weight: only 665 grams. Did you know Caribee is the No 1. travel and leisure brand in Australia? There is a good reason for this. Fifty years experience supplying the world’s most demanding travellers means you can buy with confidence, safe in the knowledge that you are getting top quality sports and travel equipment at a very reasonable price.